"It's no use crying over spilt evils. It's better to mop them up laughing." The family of Benjamin Farjeon, a prolific novelist from the Victorian period, came from humble stock, but all of the children from his household were able to carve a name for themselves in several cultural genres – such as literature, theatre and music. Harry Farjeon was a magician, composer and teacher. Herbert Farjeon was an important figure in British theatre and a stage critic. Eleanor Farjeon was an author of children's author who has a book-prize named in her honor. But the one who is of interest to us is their brother and a once famous fiction writer, J. Jefferson Farjeon. 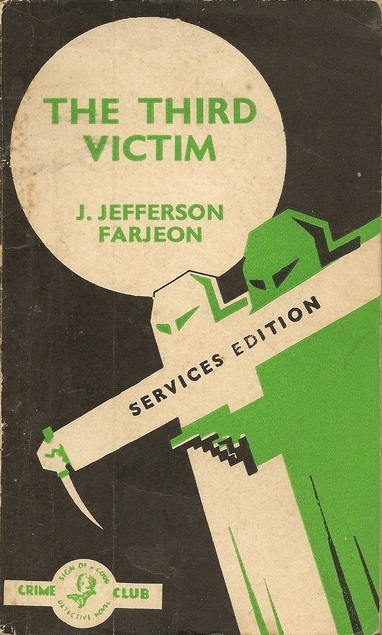 J. Jefferson Farjeon proved himself as fertile a writer as their father and reportedly a personal favorite of Dorothy L. Sayers, praising him as being "quite unsurpassed for creepy skill in mysterious writing," but his work and reputation has languished in obscurity for decades. Recently, there seems to have been a change, as he appears to be undergoing a personal renaissance, reminiscent of Gladys Mitchell's rise from literary oblivion during the previous decade – going from one of the most obscure names in the genre to having nearly all of her books reissued by various publishers. I think I can pinpoint where and when Farjeon's began to reemerge from the mists of time. On November 22, 2011, Curt Evans published his first blog-post on "The Passing Tramp," which was a reference to "one of the era's unlikeliest series detectives," Ben the Tramp, who appeared in eight of Farjeon's roughly eighty novels. Evans also seems to have been the first person on the internet to have reviewed or simply talked about Farjeon. It might just have been a coincidence, but the Poisoned Pen Press reprinted Mystery in White (1937) in 2014 and the book sold over sixty thousand copies – making it a smash hit that surprised everyone. As a result of this unexpected success, three additional titles were reissued, The House Opposite (1931), The Z Murders (1932) and Thirteen Guests (1936), with more of them on the way. Personally, my only exposure to Farjeon's work came from reading the splendid, original and very amusing Holiday Express (1935), which deserves to be reprinted, but I sort of forgot about his books that were on my to-be-read pile after that – both of them old pocket editions from Collins White Circle. So I had to decide between The Third Victim (1941) and Prelude to Crime (1948), which was decided in favor of the former. I found the synopsis of the book to be very appealing. When he walked out of the gates of Broadland Hall twenty-six years before, they "had been well kept and imposing," but now the rusty, corroded iron made "the two dignified cavaliers who had stood for centuries on the gate posts" look unimposing and the place impressed him as being "shockingly neglected." A once large staff that was needed to run the estate had been decimated and reduced to only three persons: a gloomy, fretful butler, named Dyke, who appears to be under the thumb of the antagonistic housekeeper, Mrs. Peto. And there is a gardener who "believes in skeletons and headless men and such nonsense." Worryingly, this bunch of characters have been looking after Lyster's invalid mother, Dowager Lady Lyster, who suffered a crippling and paralyzing stroke, which left her unable to speak and can only communicate by the feeble movements of her hands – twitching her left or right hand to answer yes or no questions. Only normal person she got see in a long time is a now middle-aged woman from the neighborhood, Evelyn Eames, who Lyster remembers as "that long-legged kid" from all those years ago and wonders why she is not bringing up a family of her own. Sad state of the place reminds Lyster of a time "when there was less dust around" and "when the house was fuller," as well as friendlier, but from the family solicitor, Mr. William Lotham, he learns there's clinging more to the estate than simple neglect. The reason for Lyster's return to England was the sudden death of his brother, who broke his neck in a fall from the high gallery into the hallway below, but Lotham informed him the tragedy occurred only an hour before Sir Maitland altered his will – which practically left everything to his brother who was still down under at the time. He was also surprised to learn there was a legacy for an adopted daughter, Ursula, which was to be held in trust for ten years and if she married a certain Ralph Murray her share would revert to Lyster. Fourteen years ago, Sir Maitland had adopted foundling twins, a pair of eight-year-olds, named John and Ursula, but the boy tragically died two years later when he fell from the high gallery. It was "in precisely the same way" as his adopted father would perish twelve years later. Lyster concludes "there’s not only dust in this house," but poison as well and swears to clear it out – so one can breath again. Lyster engages the services of Detective Kendall and Sergeant Wade, once attached to Scotland Yard and now operate as "the private detectives in the kingdom," who came to Broadland Hall in disguise for a discreet enquiry. Kendall plays the role of an history enthusiast, "Headley Swayne," who comes to Broadland Hall to gather material for his book, The Historic Homes of Britain. Wade has to be contend with playing a second butler to the place. It’s an arrangement described as a bit of a comedy, but, stylistically, it has an interesting affect on the story and characters: the infusion of a bunch of normal and sane people in the formerly dark, neglected and decaying home begins to have a similar effect on the place as airing a house that had been boarded up for years. Past shadows are slowly being shooed away and slowly they are getting closer to identifying the murderous entity lurking in the home, which may be one of the books two sole weaknesses. The first of these two weaknesses is the clueing, which is really nothing more than foreshadowing. It nods in the direction where the explanation can be found, but nothing more than that and you can only really guess the murderer's identity. Secondly, the identity of the murderer who serves here as a jack-in-the-box surprise, but I think the murderer belonged to both a different genre and period of time. I thought The Third Victim was not unlike one Annie Haynes' nineteenth century-style detective novels with an ending that could have been lifted from the pages of an Edgar Allan Poe story. It could make for a splendid and fun period story, but I was hoping the ending would have been a continuation of the first three quarters of the story, which constituted the best parts of the book – both story-and plot-wise. Stylistically, the ending struck a bit of a false note, because it moved along the lines of a British country house mystery before ending up in Poe country. However, I can easily imagine this will be less of a problem to readers who are warned there's a sharp twist in the road towards the end of the story. So you can thank me for going ahead and warning you about it. Finally, I have to note that The Third Victim struck me as an indoor version of Ivans' De bosgeest (The Forest Spirit, 1926). Well, I'll be back with something definitely classical for the next blog-post. I should probably also try to write a rambling blog-post again or finally re-write and update this list. But that's something for the future. "The whole point and headache is this. Every microscopic opening in that room – the tiny little crack under the door, the keyhole, the joins of the two windows where the sashes meet – every place is sealed up as tight as a drum-head by glued paper fastened on the inside." Clayton Rawson was an illusionist, mystery writer and editor who worked in editorial positions for various magazines, such as True Detective and Master Detective, which include having served as the Managing Editor for the famous Ellery Queen's Mystery Magazine, but he's primarily remembered as one of the Golden Era's foremost practitioners of the locked room conundrum – which were hatched by drawing on his extensive knowledge of magic, illusions and stage-effects. 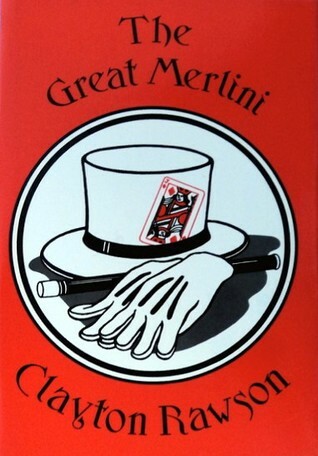 He even employed stage-magicians as the detective characters for both of his series: namely The Great Merlini and Don Diavolo. One of the detective story’s greatest champion, Frederic Dannay, better known as one half of "Ellery Queen," described Rawson as "one of the topflight mystifiers in the whole bloodhound business." It's an opinion that was shared by John Dickson Carr, undisputed master of the locked room mystery, who was a friend of Rawson and on several occasions they concocted a challenge for each other – resulting in some excellent and even classic examples of the impossible crime story. 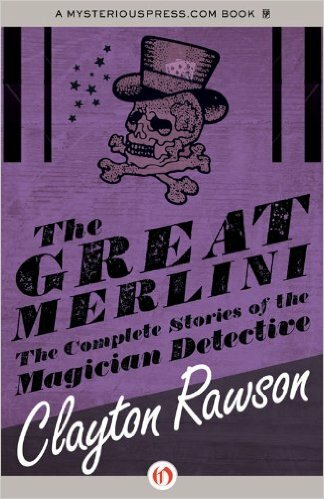 Two of those stories were collected in The Great Merlini: The Complete Stories of the Magician Detective (1979), which gathered all of the short stories and short-shorts about his most well-known and best-remembered creations. You guessed it: this flimsy introduction serves as a rickety bridge to my review of that very collection. There are a dozen tales in this collection and the first three were originally published as reader-contest stories in EQMM, which reportedly flooded their offices with "an overwhelming response that many more prizes were awarded than the original number offered." I found them to be fairly clever for a bunch of short-shorts and comparable in nature to the nuggets of challenging crime-fiction found in Ellery Queen's Minute Mysteries and H.A. Ripley's How Good a Detective Are You? (1934). In the first story, "The Clue of the Tattooed Man," there's an apparent impossibility clinging to the strangling death of a snake-charmer, Zelda, who was found in a hotel room on the eight floor with the only window "locked on the inside." A game of craps was being played by a group of circus performer in the corridor and they observed the only door providing an entrance or exit to the crime-scene. It was an all right story for something that short. Interestingly to note: this short-short was not jotted down by Robert Adey in Locked Room Murders (1991). The next one, "The Clue of the Broken Legs," concerns the shooting of a theatrical producer, Jorge Lasko, who was bound to a wheelchair with two broken legs, but his murderer "vanished into thin air like a soap bubble" from a locked and guarded room. Not exactly a classic of the form and the explanation to the impossible murder is a slight variation on an old trick, but nice enough for a short-short. I thought the plot of the third story, "The Clue of the Missing Motive," had the potential for a longer story, which deals with a gunman who took "potshots at an unidentified man in New York City’s Washington Square Park" with fatal consequences. The shots came from the direction of a house where everyone had a motive to kill one another, but they all lacked a proper motive for the murder of the man who actually got felled by a bullet. The first actual short story from this collection, "From Another World," was the result of a sporting challenge between Rawson and Carr, in which they tried to best each other by trying to come up with the cleverest possible explanation for a locked and airtight room – the "sealed room to end all sealed rooms." Rawson opened his story in Merlini's magic supply store, "undoubtedly one of the world's strangest rooms," where the magician-detective receives a visit from his friend and narrator, Ross Harte. Harte is also a reporter and is researching an article about extrasensory perception (ESP), psycho-kinesis (PK) and clairvoyance, which is why he stopped by Merlini on his way to the home of a millionaire. Andrew Drake has grown obsessed with psychic phenomena and wants to sink several of his millions in researching the potential power of the human mind, but wants to convince himself by setting up a séance with a medium, Rosa Rhys – who is described as one of "the greatest apport medium" currently operating in the United States. However, when Harte arrives at the home of the millionaire, he has to break down the door to the room where the séance was being conducted and what was found inside that room was bizarre: the bloodied remains of Drake, an unconscious, skimpily-clad Rosa and every crack or opening was covered with gummed paper. The room was literally sealed shut from the inside! Rawson constructed a splendid and original trick to explain the sealed room, which had a clever piece of misdirection that even managed to stump Merlini for a brief moment. On top of that, the sealed room trick was tagged to an equally motive and a very convincing murderer – which made for a genuine classic locked room story and short detective-fiction. You can find Carr's explanation in the book that provided an opening quote to this blog-post. I originally read the next story, "Off the Face of the Earth," in Death Locked In: An Anthology of Locked Room Stories (1987), which mentioned in the introduction how Carr posed the premise of the story as a challenge to his friend: a man walks into a telephone booth and vanishes – followed by "work that one out." Once again, the magician and mystery writer rose to meet the challenge. Inspector Homer Gavigan drops by Merlini with a rather peculiar problem: a chorus girl, Helen Hope, has gone missing and a very strange individual accurately predicted her disappearance. Bela Zyyzk claims to be "a momentary visitor to this planet" and is "a mindreader to boot," but Gavigan is the eternal skeptic and drags the self-proclaimed alien in front of a judge – which is when he makes another prediction how "the Outer Darkness is going to swallow Judge Keeler" as well. That's a problem for Gavigan. Judge Keeler is as crooked as a politician with scoliosis and has been pocketing fix money from the local mobsters, but they are in the process of closing a tight net around the Keeler. So the last thing Gavigan wants is for the judge to disappear from the face of the earth and sticks a tail on him. The policeman charged with following him around never let him out of their sight for even a second, but there was a moment when the judge slipped into a phone booth. A phone booth of which "the back wall is sheet metal backed by solid marble" and lacked any "sliding panels, hinged panels, removable sections" or "trapdoors," which made a secret and unseen escape all but impossible – which is nonetheless what Judge Keeler managed to pull off. He entered a phone booth with only a single entrance and exit, watched by the police, proceeded to vanish from it. Leaving only his smashed, horn-rimmed glasses behind and a dangling phone receiver from which a voice was heard saying, "this is the end of the trail, Lieutenant." Overall, the story does not soar to the same heights as the previous one, but it's still excellent and loved how Merlini improved on the trick for his demonstration. For the next story, "Merlini and the Lie Detector," we return to the second batch of short-shorts that were used to challenge the readers of EQMM, but the murder of a TV producer proved to be unmemorable and not particular fair to the reader. I honestly did not care for this one. However, I did enjoy "Merlini and the Vanished Diamonds," which is of special interest to fans of Ellery Queen and his detective stories about extensive searches of persons and rooms for vanished objects. In this particular short-short, Merlini provides assistance to Inspector Gavigan and the Customs Service by helping to find a stash of "top quality blue-white stones." The person suspected of having hid the stones is a known crook and cardsharp, Pierre Aldo, but they have done a complete search of his person and cabin – without any result. Luckily, Merlini has a pretty good hunch where the diamonds may have been hidden. A fair story on the surface, but the experienced Customs officer, who rattled a whole slew of examples of diamond smuggling, probably should have checked that place, but, regardless, I still liked it. But I like these kinds of stories. My favorite is probably Ellery Queen's "Diamonds in Paradise," which is a cute short-short collected in Queens Full (1965). There's also Arthur Porges' "The Scientist and the Invisible Safe," from The Curious Cases of Cyriack Skinner Grey (2009), and "The Problem of the Missing Necklace" by Jacques Futrelle, which I recently reviewed in my takedown of several of his locked room mysteries. The last of these short-shorts, "Merlini and the Sound Effects Murder," deals with the shooting of a sound effects specialist and the sound of his murder has been recorded, but Merlini solved the murder by noticing something that was not on the recording. A simple and somewhat disappointing story. The next story, "Nothing is Impossible," tackles a subject not often dealt with in this genre of ours: ufology. Albert North is an aviation pioneer who has become interested in the study of extra-terrestrial visitors and has become "an unofficial clearing house for saucer information," but the circumstances of his strange death seems to indicate the aliens found him too inquisitive. North is found dead in his locked office and the only other person present in the room, his son-in-law, was unconscious and completely naked – his clothes "appear to have passed through his body." However, the impossibility is not the locked office door, but how the murder weapon is nowhere to be found and the presence of strange footprints of two-foot, three-toed alien on the dusty surface of the file cabinet. Not a mind-blowing classic of the locked room sub-genre, but interestingly enough for its ufology background X-Files vibe. The next story has a great title, "Miracles – All in the Day's Work," in which Inspector Gavigan was looking forward to his first vacation in over three years, but dropped by a fishing friend on his way to the Maine woods and became a witness to his seemingly impossible murder – because his murderer vanished from a watched room on the top floor of a New York skyscraper. A fun and interesting enough, but fails to pose a true challenge to the reader. You should be able to identify the murderer and gauge the main idea behind the locked room trick. I found the next story, "Merlini and the Photographic Clue," not to be very memorable, which revolved around the murder of a gossip columnist and a photograph that showed a person could be at two places at the same time. Clayton Rawson shows-off "The Headless Lady." The final story from this collection, "The World's Smallest Locked Room," begins with a sincere apology from Ross Harte for having been "so remiss in keeping you up to date on The Great Merlini," which is followed by an update on his life and how his magic shop has become "the largest emporium of magicians’ supplies in the world" – even receiving orders "written in Swahili" from "witch doctors in the Congo." The impossible problem is an attempted poisoning at a place called Pancakes Unlimited, but the plot is fairly minor and I found the snippets of background information, characters and historical references far more interesting. There's a private-investigator, named Hammett Wilde, who's "no relation to either Dashiell or Oscar," and there was a reference to the moon landing to show some time has passed since the earlier stories, which is probably why the victim was given the name of Hassleblad. So, all in all, a fair collection of short-shorts and short stories, but I had already read the best ones in the various, well-known locked room anthologies. However, I did not mind reacquainting myself with those excellent impossible crime stories. More importantly, this volume has whetted my appetite for the Don Diavolo novellas and The Headless Lady (1940), which is the last unread Merlini novel residing on the big pile. So you can probably expect more Rawson in the not so distant future. "Oh, ah. Adventure... there's plenty of 'em chum." 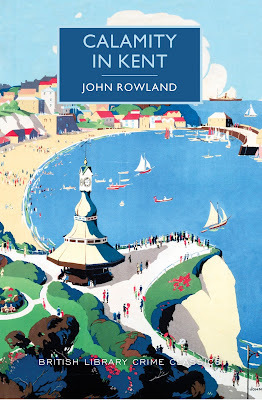 John Rowland hailed from Cornwell, England and over the course of his lifetime, he had worked as a publisher, journalist, civil servant and even as a Unitarian minister, but what is of interest to this blog was his prolific spell as a mystery novelist – which lasted from 1935 until 1950. Rowland was one of those minor-league mystery writers who passed into obscurity at the dawn of the second half of the previous century. Thankfully, the Poisoned Pen Press has blown the dust from two of his novels, Murder in the Museum (1938) and Calamity in Kent (1950), which has since been reissued under their banner of British Library Crime Classics. All of them prefaced with an introduction by a familiar genre historian and crime novelist, Martin Edwards, who can be found blogging at "Do You Write Under Your Own Name?" 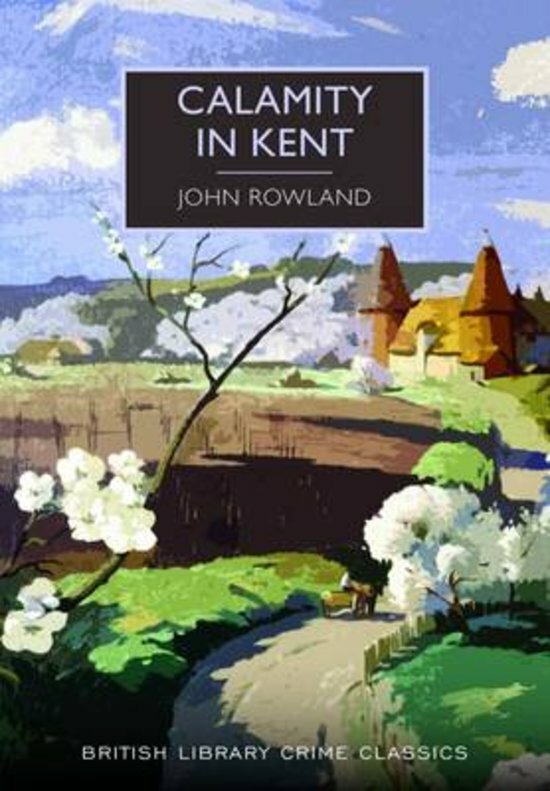 I picked Calamity in Kent as my formal introduction to the work of Rowland for an obvious and predictable reason: the book was catalogued by Robert Adey in Locked Room Murders (1991), but one would be wise to heed Edwards' cautious warning not to expect "the devilish ingenuity that one associates with, say, the Americans John Dickson Carr and Clayton Rawson" – because the locked room conundrum is very simplistic and only a minor part of the plot. However, I stubbornly refused to lower my expectations, which I based on a hunch. But more on that later. Despite my refusal to take a hint, I enjoyed reading Calamity in Kent and took a particular liking to the narrator, Jimmy London, who is a newspaper reporter, but the first chapter of the book finds him recuperating from an operation. The place where he tries to regain his strength is a small, Kentish seaside town, called Broadgate, planted on the coast of South East England. One morning, while taking an early stroll, London notices a man who acts "queerly" and "seemed to be drunk, or stunned, or shocked," which rekindled his journalistic instincts, but even London was surprise to learn the cause of the mans distress. The name of the troubled-looking man turns out to be Aloysius Bender and he's the operator of the cliff railway, known locally as the Broadgate Lift, but when he wanted to open up for business that morning he found a dead man inside one of the locked carriages – a hilt of a nasty-looking knife sticking out of his back. London seizes on the opportunity presented to him and takes the first step in getting his name back into circulation by searching the scene of the crime, which he knew was, strictly speaking, not entirely legal. But he had to put his "own future as a journalist first." And if he to take a pocketbook he had fished from the victim's clothes, so be it. Rowland has an airy, light-hearted sense of realism about the conventions of the detective story and the actions of his characters. As I said, London pounced on the chance to return to the pack of newshounds roaming Fleet Street and contacted the newspaper who seemed most likely to pay him "a sensible fee as a special correspondent," which he got with The Daily Wire and dictated "a cold-blooded piece of butchery" over the phone for the his first installment – excusing the adjectives that there was "the added spice of a genuine mystery story behind it." However, London’s friend and insight man at Scotland Yard, Detective-Inspector Shelley, remarks how London seems to make "a habit of being in on the beginnings of murders" and advises him not to find "too many bodies," because they have suspicious minds at the force. On the other hand, Shelley is aware that the mighty machine of Scotland Yard is a slow-moving one, which prevents individual cogs to tail a hunch like a lone wolf. So he understands the potential use of a free agent and is not averse to pooling his information with London. It's a collaboration that slowly exposes the criminal network surrounding the victim, John Tilsley, who is suspected of black market racketeering, but that's pretty much all I have to say about the plot. I loved the narrative voice of London, the setting and the characters that were found there, but the plot turned out to be as light-weight as the writing and began to move towards thriller territory after the halfway mark – which naturally came at the cost of it not being a (pure) detective story. I was actually reminded of such smart-alecky type of mystery/thrillers like Maurice B. Dix's Murder at Grassmere Abbey (1934). Finally, I have to comment on the locked room angle, which was very minor part of the story. London and Shelley mentioned throughout the book about the impossibility of how a body was able to end up in a sealed carriage without the locks being tempered with, but the explanation given in the final pages of the book were extremely underwhelming. I had been warned in the introduction about this, but the lock in question was described as "a massive padlock of an old-fashioned type" that "tied the two gates together," which convinced me I had found either the originator or an early example of a certain locked room trick I had only come across in a handful of post-GAD stories. But I was wrong. It turned it was only a nominally locked room mystery. 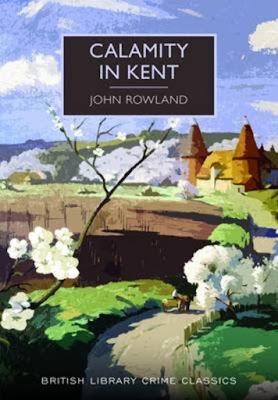 I've the sinking feeling I gutted Calamity in Kent with this lackluster review, but I genuinely liked the book and it says something for Rowland he was able to hold the attention of a reader like me – after moving away from a locked room mystery to a smart-aleck thriller. Well, guess I'll be dipping into an actual impossible crime story for my next read. "Obviously his hiding place must be something not only normal... but a location utterly above suspicion—invisible, not literally, but one the police see right through, and don't dream of checking." Two weeks ago, I reviewed one of William Arden's contributions to The Three Investigators series, The Secret of Phantom Lake (1973), which mentioned my previous blog-posts about Robert Arthur's The Mystery of the Whispering Mummy (1965) and The Secret of Skeleton Island (1966) – which caught the attention of a fellow blogger who left a couple of interesting comments on my review of Skeleton Island. Mike West is a writer who blogs at Strange Tales: The On-Line Presence of Mark West and wrote an insightful overview of the series, "Nostalgic for My Childhood – The Three Investigators," and compiled an "All Time Top 10." In addition to a number of reviews of books from the series. As long-time readers of this blog know, I find enthusiasm about detective stories to be very contagious and Mark West's post about The Three Investigators compelled me to plot an early return to the series. I settled down on the twenty-third entry in the series, The Mystery of the Invisible Dog (1975), which was penned by M.V. Carey and it was one of the sixteen titles she wrote for this long-running series – making her one of the most prolific contributors to The Three Investigators. My reason for picking The Mystery of the Invisible Dog is as simple as it banal: I knew a key point of the plot was based on a short story by my favorite mystery writer, John Dickson Carr. The story in question is even mentioned and described, but the plot of this book does not feature any seemingly impossible problems. On the contrary, but more on that later. The Mystery of the Invisible Dog largely takes place during the dark hours of a late and chilly December. Jupiter Jones, Pete Crenshaw and Bob Andrews tightly wrap themselves in another case in order to avoid Jupe's Aunt Mathilda, because they do not want to spend their holiday doing odd jobs on The Jones Salvage Yard. So a client is very welcome. Mr. Fenton Prentice of 402 Paseo Place is a patron of the arts, who gives "generously to museums and individual artists" and his apartment is "a luxurious showcase for an art collection," which is stuffed with paintings, statuettes and antiques. However, it makes his problem all the more peculiar. Someone has been entering his apartment and rummaging through his papers, reading his letters and left desk drawers partially open, but Prentice "had a special lock installed" and even the manager of the apartments, "that loathsome Bortz woman," had no way to enter his rooms – yet there's someone who can enter and leave them without his knowledge. Who's this intruder and why does this person left any of the valuable items in the apartment untouched? There's something else going on: Prentice is plagued by the unsettling feeling of being haunted and watched by an elusive, shadowy and ghost-like figure. A shadowy figure who shows himself twice to Jupe! One of them occurred halfway through the book and could easily have been a promising setup to what could have been an intriguing impossible problem. Jupe experiences "a sensation of a darker darkness" in the corner of the apartment room, but when he jumped towards the corner "his hands groped at walls" – simply "plain plaster walls." I had the silent hope this would have been something along the lines of Joseph Commings' "The Black Friar Murders," collected in Banner Deadlines: The Impossible Files of Senator Brooks U. Banner (2004), but that turned out not to be the case. Anyway, we have not even gotten to the meat of the plot. During their first visit to Mr. Prentice's apartment, Jupe, Pete and Bob happened to witness a man fleeing from the police and it turns out this person burglarized the home of the late Edward Niedland – an artist and personal friend of Mr. Prentice. Niedland had made a crystal sculpture of a hound for Prentice, which was based on a two-hundred year old legend from the Carpathian Mountain: one of the half-starved hunting dogs of a Transylvanian nobleman killed a child from the village and his nonchalant response was answered by a stone being hurled at his head. The noble man was fatally injured, but used his last breath to curse the villagers and vowed he would return from the grave as a huge, demonic hound. He must have been a relative of Vigo the Carpathian. 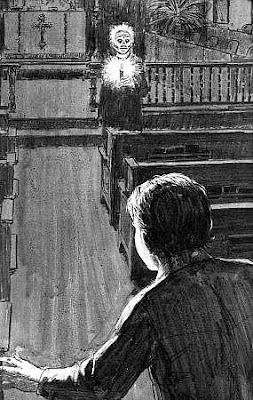 The theft of the crystal statuette triggers a series of crimes in the neighborhood, which begins with the attack on the caretaker of the local church and an appearance of the ghost priest that reportedly haunts the place – holding a flickering candle. But after that the crimes really begin to pile up: a batch of poisoned chocolates gave someone a severe case of indigestion, a small car bomb forced a car to uproot a fire hydrant and there was a serious house fire. One of the policeman remarks how "things have been really weird on this block the last couple of days," but the theft of the Carpathian Hound and the string of apparently erratic crimes following in its footsteps constitutes the best part of the plot. I really appreciated how they were all linked together and loved how cleverly the hiding place for the statue was used as a piece of (prominently displayed) background scenery. I thought that part of the plot was very well, but the explanation for the ghostly apparitions was maddeningly disappointing. Apparently, the supernatural has a sway in Carey's rendition of The Three Investigators, which makes me very, very hesitant about her other contributions to the series. I do not want to see ghosts, astral projections or any kind of magic seriously being used as a potential explanation in detective fiction. There always has to be a natural answer to apparent supernatural phenomena in detective fiction. 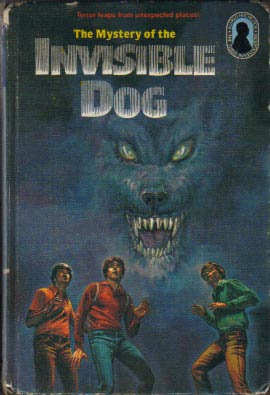 So I really feel split on The Mystery of the Invisible Dog: on the one hand, I really liked the parts of the plot which dealt with the theft of the Carpathian Hound, but disliked the supernatural aspect of the story. Guess the next time I pick up a novel about The Three Investigators, it'll be one by either Robert Arthur or William Arden. 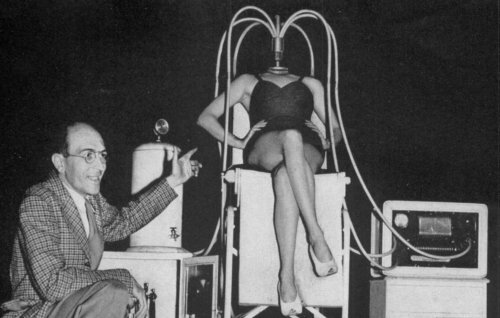 But for my next blog-post, I'll be returning to the Golden Age of Mysteries. So stay tuned! "The word impossible does not enter into a detective's dictionary." 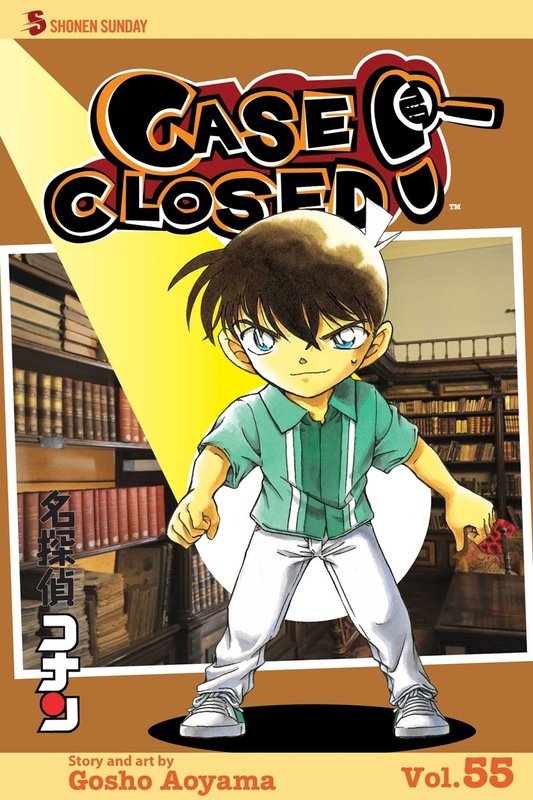 The 55th volume of Case Closed, commonly referred to around the globe as Detective Conan, takes off where the previous volume left the reader hanging, which is on a deserted and isolated island where a TV special is being shot about teenage detectives. Predictably, a murderer is hiding among the group of promising sleuths. In the previous volume, invitations were dispatched to the four corners of the Japanese islands and summoned some of the brightest young minds the land has offer: Natsuki Koshimizu from the South, Yunya Tokitsu from the North, Harley Hartwell from the West and Jimmy Kudo was supposed to represent the East, but since he can only attend as his alter ego, "Edogawa Rampo," his place was taken by someone else – namely Saguru Hakuba from volume 30. Not everything is what it seems and soon one of them is murdered under seemingly impossible circumstances. Yunya Tokitsu is bludgeoned to death with a hammer in an upstairs room of the abandoned house and his body is propped up against the window, which was securely fastened from the inside. Same goes for the door. It's a classic locked room murder and a bludgeoning was definitely not part of the scheduled program, because, as Hartwell remarks, who has ever "heard of a reality show with a real-life body count," but the murderer is evidently playing a game with them – even planting such clues as the scent of lavender and toolboxes in every room. The locked room gimmick is not entirely original, but Aoyama added to the trick and executed it with excellence. I really liked the impossible crime aspect of the plot. However, the best part of the story was its take on the so called "Fallible Detective," which showed the dire consequences of playing detective and getting it completely wrong. I also hope some of the detective characters will return at some point in the series. The next story is a fairly minor one, covering only three chapters, but one that's of interest to Western readers of the series, because, for once, we got a shot at actually solving a language-based clue – which usually are based around kanji and the fairness of those stories are often lost in translation. Story begins when Doc Agasa, Conan and the members of the Junior Detective League return from a disappointing soccer match and strike up an acquaintance with a German, named Rutger Heinen, who is attacked a short time later in the parking lot. He suffers a serious head injury and identifies George as his assailant, but Conan figures there's a double meaning to his confused statement and correctly interprets the bilingual clue. It's an English-German play-on-words and would have worked just as well in Dutch. So it's a pity the Dutch translation of this series never got past ten or so volumes, because this would have been an easy code cracker to translate into Dutch. You can read the third and longest contribution to this volume as an origin story: Conan is reminiscing about a dark night, many years ago, when he sneaked into the school library with Rachel to show her there's no such thing as ghosts – except they do find a rather mysterious figure there. A shadowy person perked on top of a bookcase, reading a novel by Maurice Leblanc, who issues a challenge to the young detective and subsequently vanishes from the room. Jimmy is not impressed with his cheap trickery and called him "just a clumsy magician," but he still picked up the challenge. What follows is them crisscrossing around town in search for clues and trying to break several codes, which appear to have severely over-valued the mental capabilities of a still very young Jimmy Kudo. The best part of the story was seeing many of the side-and background characters as they were before the series began, such as a slightly younger and darker haired Doc Agasa. I also appreciated how a previous story from one of the earliest volumes put me one the wrong track, because I expected a similar outcome in this story, but Aoyama cleverly used, what was perhaps the most predictable ending, as a false solution – which gave this story a satisfying ending. However, Aoyama's love for parallel-characterization is in full swing in this story and added even more layers to the web of interconnecting and parallel relationships and personalities in the ever-expanding Detective Conan universe. The volume ends with a filler story, consisting of only two chapters, in which Rachel is gripped by the fear that her mother is seeing another man and therefore will never give her father, Richard Moore, a second chance. Conan helps her figure out who this man might be, but the explanation is ludicrously simple and there's no excuse for not arriving at the answer before Conan does. It's one of the simplest mysteries I've ever come across in detective fiction. You can also find another example of Aoyama's parallel-characterization on the final page of this story. So, all in all, a reasonable solid volume of stories of which two were both excellent and very memorable. Dr. Gerhardus Hellinga was a Dutch internist, endocrinologist and the founder of andrological fertility science in the Low Countries and a founding member of De Vereniging voor Fertiliteitsstudie (Society for Fertility Study), which lead to him becoming a Principal Assistant in the Department of Internal Medicine of the Free University of Amsterdam. He worked there until his retirement. After retiring from a professional life dedicated to medical research, Hellinga began to work on fulfilling a life-long cherished ambition: writing and crafting a misdaadroman (detective novel). I did not make that up in order to fluff this piece up. It was mentioned in his "In Memoriam," which noted "he had once said he would like to write a detective novel," but he put four of them to his name – before passing away in 1991 at the respectable age of 84. So, now that we got that shakily and clumsily written introduction out of the way, we can take a look at his debut novel. Under the penname of "Hellinga Sr," he wrote not one, but four, mystery novels and three of them had a small village physician, Dr. Joris Joris, as the detective. Moord in het vierkant (Murder in the Square, 1981) was the first one in this short series. Dr. Joris suffers from "ziekelijke vetzucht" (morbid obesity) and as a result he's colossally fat with enormous shoulders and arms. Fat bulged around his neck and on his back. He barely had any hair on the top of his head, but it grew wildly above his ears and on the sides of his cheeks, which made his face look extra wide – giving it the appearance of "the head of a lion." His impossible fatness made him depended for personal care on his assistant, Hannes. Otherwise, he would have been regarded as an invalid, but the personal care he received from his assistant allowed him to continue to work as a doctor and make his patient rounds in the village. The village of Bikhoven is a fictional place, nestled in a quiet polder landscape of the Province of North-Holland, which has a square grassy area that's completely surrounded by a complex of houses and streets – known in the village simply as Het Vierkant (The Square). Life in the village has remained relatively simple and there are still living remnants of the past, but, above all, it's a peaceful and quiet place. But that all changes when one of the prominent locals is murdered. Scene of the Crime: Bikhoven, N.H.
Paul van Dam was a Public Notary, or simply notaris in Dutch, whose lifeless body is found inside his office: a revolver was clasped in his hand, blood stain on his coat and the door of a wall safe was swung wide open. After the discovery, the rumor mill of the village assumed Van Dam had shot himself, but Dr. Joris immediately determines the blood seeped from a stab wound. It's murder! You could easily describe the subsequent investigation as a "Case for Three Detectives," because there are three of them. Firstly, there's Dr. Joris and he tows around a young man, Alexander Arnolds, who's dating one of the doctor's daughters, Dolly, but he may have been in the village at the time of murder on a work related assignment – as he's attached to one of the government ministries and usually does investigative work for this ministry. It may have been related to another village prominent. The last one is a rechercheur (detective) from Amsterdam, Mr. Verlinde, but he's a fairly minor character in the story. Well, they encounter a surprising amount of suspects and motives in the small village, which cuts through all of the social strata of the village life: the Belgian wife of the mayor, who had an extramarital affair with Van Dam, and her husband may have wanted him out of the way because he was against the purchase of a plot of land by the village counsel. Klaas ten Cate is a chemist and claims to have made an important invention, which he wanted to sell to the Ministry of Defense, but he's not very popular with his fellow villagers on account of his loose morals and cruelty to animals. A Japanese man was beaten up by a German guest in the local lodging house, called "De Kat," after which he vanished from the stage and Japanese man was brought to the local hospital. There's woman suffering from insomnia, known to everyone as Aunt Alie, who keeps an eagle eye on her fellow villages with a pair of spyglasses and Dr. Joris calls her "the best spy he has." There's an old-fashioned barber, who saves his customers "like his father did fifty years ago," but he's also one of the prime movers of the local rumor mill. This all makes for a very readable and enjoyable story, but, as the cogs of a plot, they were rendered useless when both the false and correct explanation fingered two persons outside of this closed community of suspects who only played a small part on the sidelines of the story – which also tied in with the obvious motive and made the murders incidental. Oh yeah, there's a second, completely unnecessary, murder and the culprit conveniently commits suicide. So I was left profoundly disappointed after that rather under whelming ending. It's why this review is so poorly written without much of substance, because, plot-wise, most of interesting stuff was thrown out of the window by the end. I wish I could end my return to the homegrown detective stories of my country on a more positive note, but the ending was really disappointing. Well, I did like the Dell Mapback-like map of Bikhoven and enjoyed the character of Dr. Joris Joris. Several times, Dr. Joris took a break from the story itself to sit down on his soapbox and lecture about his unorthodox opinions on doctor-patient confidentially, village life, the future of medicine and the effects the sound of a name has on shaping a child's personality. It gave him that aura of the Great Detective and he deserved a better case to help solve, but I've read De breinaaldmoorden (The Knitting-Needle Murders, 1983) is supposedly to be his best effort. So I'll probably give that one a shot somewhere down the line. Well, I hope I'll be returning soon with something better. In the meantime, you might want to read my previous review, in which I took a closer look at some of the locked room mysteries penned by Jacques Futrelle during the early 1900s.